The distance from your vehicle to nearby obstacles when parallel parking or maneuvering into a garage is measured by the sensors and communicated via the multi-information display and a buzzer. Always check the surrounding area when using this system. 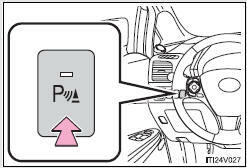 When on, the indicator light comes on to inform the driver that the system is operational.